I would like to share FREE one of my small app. 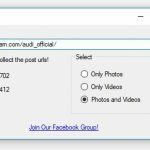 It is an Instagram bulk downloader. Easy to use, and working automaticly. Just add the instagram account url, and push start. When its ready, you can find images in the root folder of the program, or just push “Open Imgs Folder”. You can select download only videos or only images or all. Its working under .NET 4.5 and above. It is a windows Program.